Team Iam's Matteo Pelucchi crosses the finish line to win stage 2 of Tirreno ahead of Ireland's Sam Bennett in fourth, far right. 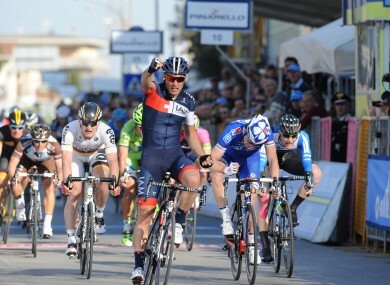 ITALIAN MATTEO PELUCCHI pipped French spinter Arnaud Demare to win the second stage of the Tirreno-Adriatico, with Mark Cavendish retaining the overall lead of the Italian stage race today. Sam Bennett took fourth in his first sprint against World Tour opposition. While Cavendish missed the final sprint, Pelucchi caused a minor upset by beating a host of bigger-name rivals, including Demare and German Andre Greipel, to take his fifth career win. Previously, Pelucchi had won the Clasica de Almeria (2011) and three stages from smaller races like the Four Days of Dunkirk, The Ronde de l’Oise (2012) and the Circuit de la Sarthe (2013). A late crash before the final sprint took down several riders, including German stage contender Marcel Kittel. Cavendish avoided the incident to finish just behind and consolidate the race lead he inherited after his Omega-Pharma team’s winning ride on the team time trial opening stage on Wednesday. But the Isle of Man sprinter will hope, at some point, to hand over the race lead to Polish team-mate Michal Kwiatkowski, one of the overall favourites and who is currently second, on the same time as Cavendish. The early part of the stage was lit up by a breakaway which formed after just two kilometres, but with the sprinters’ teams driving the chase, the last remnant of the morning escape, Britain’s Alex Dowsett (Movistar), was reeled in a few kilometres from the finish. Demare, sitting on the wheels of three teammates in the finale, and Greipel looked in contention for victory, however Pelucchi produced a winning burst which gave the 25-year-old former keirin specialist his biggest win so far. Friday’s third stage is a 210 km race from Cascina to Arezzo which should favour the climbers and all-rounders who can produce a strong finish on slightly uphill terrain. 1. Marc Cavendish (GBR/Omega-Pharma) 4hr 16min 25sec, 2. Michal Kwiatkowski (POL/Omega-Pharma) same time, 3. Rigoberto Uran (COL/Omega-Pharma) s.t., 4. Mark Renshaw (AUS/Omega-Pharma), 5. Wout Poels (NED/Omega-Pharma) both same time, 6. Alessandro Petacchi (ITA/Omega-Pharma) at 2sec, 7. Tony Martin (GER/Omega-Pharma) 3sec, 8. Daryl Impey (RSA/Orica) 11sec, 9. Svein Tuft (CAN/Orica) s.t., 10. Ivan Santoromita (ITA/Orica) s.t. Email “Sam Bennett makes statement with fourth place in Tirreno-Adriatico”. Feedback on “Sam Bennett makes statement with fourth place in Tirreno-Adriatico”.